Avg. Group Discount of 22.1%! National Mall, Verizon Center, Smithsonian Museums, Spy Museum, White House, Holocaust Museum, Convention Center, Capitol Hill. The Donovan House is located in the vibrant Thomas Circle neighborhood of Washington, DC and within walking distance to the DC Convention Center, The White House and the National Mall. The neighborhood also boasts a number of high end, eclectic dining options in addition to several quick eat options including Cosi, Starbucks and Corner Bakery. The guest room design by Studio Gaia breaks away from the traditional bathroom and bedroom layout by connecting the two rooms with a special cocoon spiral shower. All rooms and suites feature custom SFERRA linens, individual temperature control units, two-line phones with speaker and conference capabilities, and in-room safes. The bathrooms are replete with bath apothecary and luxury spa products. Entertainment options include a flat screen TV, on-demand movie library, I-POD docking station. Additionally WI-FI and broadband internet access are provided throughout the hotel. The in-room pantries offer Dean & Deluca gourmet snacks. In the summer months, the rooftop pool and bar offers uniques views over Washington DC. Location - The Donovan House hotel is located in the middle of Thomas Circle in historic downtown Washington, D.C.
Hotel Features - With over 192 rooms, 14 floors, and resort-style appeal, the Donovan House feels like a grownup playground. The hotel offers a rooftop pool and a rooftop lounge, which can be used by guests after regular hours. The best qualities this hotel has to offer are its hanging chairs and modernist feel in the lobby. Valet services and Wi-Fi are available for a fee. Guest Rooms - Rooms at the Donovan House feature lustrous, modern decor and cocoon spiral showers. Other services offered include movies, air conditioning, and turndown service upon request. Cribs are available for young children upon request. Gratis newspapers are provided each morning. Dining - Zentan, the Donovan House’s on-site restaurant, is a pan-Asian dining experience which offers top meals with abundant flavored meats. The restaurant is best known for its sushi – brick roll or spicy lobster – other favorites include crispy garlic chicken, scrumptious chocolate cake, and the 16-ingredient Singapore Slaw. Expert Tip – Not far from the Donovan House is the United States Holocaust Museum, which opened in 1993. The busiest months are April through July; securing tickets ahead of time is recommended. Individual cancellation policy is before 3pm one day prior to arrival. Group cancellation policies may vary. We are located approximately 15 min. from Reagan National Airport (DCA) and 45 min. from Dulles International Airport (IAD). Taxi fares to Reagan National Airport start at $15 for one person and taxi fares to Dulles start at $60 for one person. Daily parking charges $25. Valet parked in a garage. Overnight parking is $49. 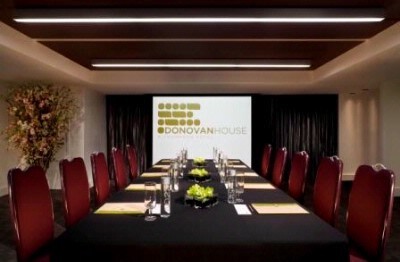 Below are the meeting, banquet, conference and event spaces at Donovan House. Feel free to use the Donovan House meeting space capacities chart below to help in your event planning. Hotel Planner specializes in Washington event planning for sleeping rooms and meeting space for corporate events, weddings, parties, conventions, negotiated rates and trade shows. Meeting room can be divided into two separate rooms. Woodward: 725 square feet, 29x25 dimensions. Bernstein: 600 square feet, 24x25 dimensions. 53 x 25 x 8 Ft.